Is now a good time to invest in stocks? Like the weather, the market outlook is a topic that can always be discussed, whatever the circumstances, and generally without much in the way of a definitive conclusion. It is often reduced to a question of whether or not the market is expensive or cheap just now. In just the past week, CAPE was sagely mentioned in both The New York Times and The Wall Street Journal. The Times called it “a conservative method” and used it to make the case that stocks are not particularly cheap at the moment. The Journal used it to make the argument that the market can be effectively timed, but left it to the reader to draw his own short-term conclusions. That predictive power is generally demonstrated by showing a high (negative) correlation between CAPE and subsequent 10 year stock market returns. In other words, when the market is more expensive as measured by CAPE than it has typically been in the past, it tends to do less well over the following decade. And when it is cheaper it tends to do better. I have several objections to this, from both philosophical/theoretical and empirical/statistical points of view. Conceptually, I have difficulty with the idea of valuing any asset (or asset class) in a vacuum. Cheap or expensive is an inherently relative statement. A scheme that will tell us if stocks are a good or bad buy without any reference to the relative prices of other potential investments is more than a little suspect. Moreover, valuing the market relative to its own history, that is, comparing the current price to the long-run average, implicitly makes the assumption that there exists some kind of true or natural price level for the stock market. That very well might be the case, but it is an awfully big assumption to bake into the analysis without further ado. Moving on to the empirical arena within which I am always more comfortable, I downloaded the stock market data helpfully provided on Shiller’s website. Using monthly observations of CAPE and the 10 year forward real stock market return from January 1881 to January 2000, I get a correlation of –0.44. That corresponds to an R squared of 0.19, which is impressively strong in the world of finance. Okay. More to the point, the combination of a ten year earnings average going into CAPE and a ten year average return as the dependent variable has a drastic impact on the effective sample size for the calculation. The spreadsheet may have 1440 monthly observations in each column but they are very far from being independent. For example, in any year the May CAPE and subsequent 10 year return pairing is nearly identical to the June one. The predictive effect of CAPE does not disappear if you use one year forward returns, but it is considerably muted. For the same 1881 to 2000 period I get a correlation between CAPE and one year returns of –0.15. That is not nearly as powerful as the ten year prediction, but it is still not too shabby. And, as Shiller tells us, one year return numbers are more noisy so our expectations need to be lower. Alas, I have a few more quibbles. As constructed, this test of CAPE has a significant look-ahead bias. That Shiller (apparently) missed this is further evidence that he was thinking of the exercise as an interesting description of historical behavior rather than a practical scheme for investing. Essentially, the CAPE measure of valuation compares the current CAPE reading to the long-run average reading to find out if the stock market is cheap or not. Problem is, that assumes that an investor knows what the long-run average is. It is one thing for us to say that back in 1932 the market was very cheap, but quite another for somebody back then to realize it. We, after all, know that 1932 would turn out to be a low never to be seen again. To effectively test this as an investment strategy we need to restrict the inputs to just data that could have been available to an investor at the time. To adjust for this, I hereby christen the Growing CAPE or GCAPE. This statistic is the same as CAPE, but for each month I divide the value by the average CAPE from January 1881 through to that particular month. In other words, it is the CAPE relative to the long-run average as it was known at that time. The correlation between GCAPE and forward one year returns is –0.12. A correlation of –0.12 not a total disaster, but we are still making an epic assumption about how clever we could have been in decades long past. It is not just that there was no internet to allow us to download a spreadsheet of numbers back in 1932, modern cap-weighed indexes as we know them, with accessible figures on such things as composite earnings, did not then exist. Which means that although investing on GCAPE was conceptually possible, as a practical matter it was not really an option. That is important because one of the great principles of financial economics is that anomalies such as simple and effective ways to time the market do not persist for long because investors will spot them and price them out of existence. But, for most of the 120 years that we are talking about, investors would have had a lot of difficulty doing that. What if we look at a smaller sample, for example the last third of the full time period, the 40 years from 1960 to 2000? 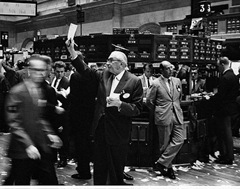 By 1960 the rudiments of modern portfolio theory were being worked out and data services and indexes that we would recognize were available, at least to the most sophisticated investors. Also, it’s a few years before I was born. The correlation between GCAPE and forward one year returns from 1960 to 2000 is +0.0024. In other words, since the end of the Eisenhower Administration GCAPE has been throwing darts. (1950 to 2000 is –0.06 and 1970 to 2000 is +0.05.) It may be a fair statement that, on average, over 120 years GCAPE (and CAPE) has been somewhat predictive of stock market returns, but most or possibly all of that predictive success happened long long ago. During my lifetime, it has not been much of a help. So as a simple market timing rule, GCAPE does not work. Is this really a surprise? Would I ruffle many feathers if I asserted that there are no such simple rules? I believe that a model that timed the market is possible, although I personally do not know how to build one. I am sure it would be far from simple. Thanks for this analysis, Frank. You’re going to have one angry Rob Bennett on your hands though! 1. I dont know how valid it is to compare the performance of stocks from 1880 to 1910 with what we expect today. The world is so radically different today from 1880 that I think what happened way pack then shouldn’t apply as relevant to today. 2. How do you account for WWI and WWII? Are we assuming for some reason that World Wars aren’t going to impact the world economy? Shouldn’t we account for that? Can you even factor out world wars from the historical financial data? You’re going to have one angry Rob Bennett on your hands though! No, that’s not so, Paul. I think what Frank is doing here is wonderful. Frank and I are not in agreement re most of the points he puts forward in this particular blog entry. But on every point he is making a logical case. We need people doing that from both sides. It is just as important that Frank make the case from his side of the table as it is that I make it from mine. I can’t address all the points raised here in a comment of reasonable length. I’ll limit myself to one. Frank is right that Shiller does not often address how to implement his findings. My guess is that that’s just because he is an academic and more interested in the theoretical than the practical. All of my work is an attempt to show how to implement Shiller’s model, which is a radical departure from the dominant Buy-and-Hold Model. I find it incredible that no one else has done this. It just amazes me. No one questions that Shiller’s model is a radical departure. Even the subtitle of his book says this! SInce the book has been widely praised, you would think that hundreds of people would have followed up by now offering implementation strategies. The reality is that I am the only one who has yet done this work on any sort of in-depth basis. That’s a strange, strange, strange reality. My take is that the explanation is that Buy-and-Hold has an emotional hold on people. Once you buy into the idea that it is always a good idea to be investing in stocks, you become EMOTIONALLY INVESTED in your belief in that model. I believe that the Shiller model will enrich us all greatly in years to come. A deepening of the economic crisis will cause people to entertain doubts about the old model and, once we get to a point where we can talk about these questions in a civil and reasoned way (Frank’s article is helping us all move a solid step in that direction), we will all be learning a great deal about how stock investing really works. I think Shiller’s model will prevail. But I would, wouldn’t I? Frank sees it the other way. Good for him for making his case rather than ducking the question (I think it would be fair to say that many other Buy-and-Holders have elected ducking to presenting a rational case in a civil manner). wouldn’t it be funny if Rob replied “By golly! I’ve been wrong!”. It could happen, elitie. I’ve been wrong before. So we shouldn’t rule out this possibility. I agree. Here’s some things a complex model might need to factor in. 1. Out of 500 stocks in the S&P 500, only 4 remain that have AAA rated credit (ADP, XOM, JNJ, MSFT). We only seem to lose them. I can’t remember the last time we actually added one. 2. The inflation adjusted cumulative trade deficit is nearly $10 trillion now. This is a relatively new phenomenon. Think “Made in China”. What’s $10 trillion? $30,000+ for every man, woman, and child in America. We keep shipping cash for hard goods. Sustainable? 3. We’re running $1 trillion plus budget deficits now. This is also a relatively new phenomenon. What’s going to happen to the inflation adjusted stock market if we either choose austerity, are forced to choose it someday, or we simply decide to hyperinflate. Debt is what is propping up this house of cards. Can the P/E “suffer” from inflation? If there are a surplus of dollars floating around the market, then that would naturally drive prices up without a naturally corresponding increase in earnings, would it not? If that is true, then the natural price of a stock is whatever the market decides it is. I can give a response from the standpoint of someone who believes in the Shiller Model and not in the Buy-and-Hold Model, Dan. Under the Shiller Model (Valuation-Informed Indexing), the price of stocks in the short term is whatever the market (comprised of emotional humans) says it is. But in the long term the market price reflects the economic realities (because otherwise the market could not serve the primary function of any market — to set prices properly). This is why stock prices are predictable in the long-term. They are always moving in the direction of fair value. To know how much prices will be rising or falling over the next 10 years, all you need to do is to compare the current price (which could be anything since it is set by emotion) with the fair-value price toward which prices will be headed over the next 10 years. The greater the extent to which current prices exceed the fair-value price, the worse is the long-term value proposition currently being offered by stocks. Frank why do you say this? Why must we assume a person must invest? Why can they not stay in cash OR pay down debts? As the WOPR said in “WarGames”. VERY interesting analysis. What is the correlation between GCAPE and 10-year forward returns?